Thanksgiving is this Thursday for most of us in the U.S., but believe it or not, I’ve already made Thanksgiving dinner twice. I’ve been determined to come up with a new main dish, a simple adaptation of my Seitan Stuffed with Walnuts, Dried Cranberries, and Mushrooms. It took me a couple of tries, but I finally came up with the perfect savory, mushroom-infused seitan roast. You’d think that after enjoying it two times in three days, my family would be tired of Thanksgiving food, but you’d be wrong. My daughter E wants me to make this again on Thursday. My husband D and I loved it as much as she did, so it’s quite possible I will be making it a third time this week. E is our family’s chief “Thanksgiving cheerleader.” She insists that we have the full feast every year, even if we’re only cooking it for the three of us. So before I get to the recipe, I thought it might be helpful to make a list of all of her (and our) favorite holiday dishes. 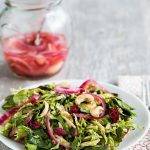 These are not necessarily the fanciest dishes on this blog, but they’re the ones we come back to year after year. Our feast always includes at least one dish from each category below, as well as mashed potatoes. Got to have the mashed potatoes! Check out our family favorites below, and if you don’t see what you’re craving, be sure to peruse my entire list of Thanksgiving recipes. 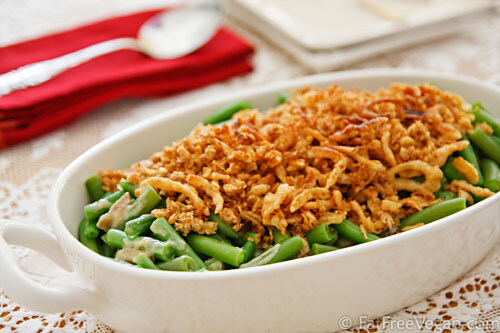 The Best Vegan Green Bean Casserole: Lives up to its name. E has to have this every year. Double-Layer Pumpkin Cheesecake: My family would probably divorce me if I didn’t make this on Thanksgiving. It’s higher in fat and uses more processed foods than I like, but everyone loves it and it’s only once a year. 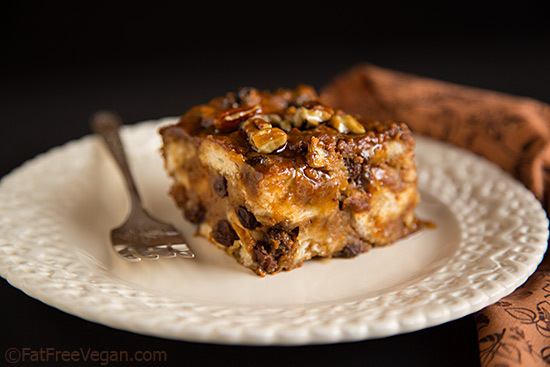 Sweet Potato Casserole with Pecan Topping: This casserole is a dessert in my family. Make it and you’ll see why! 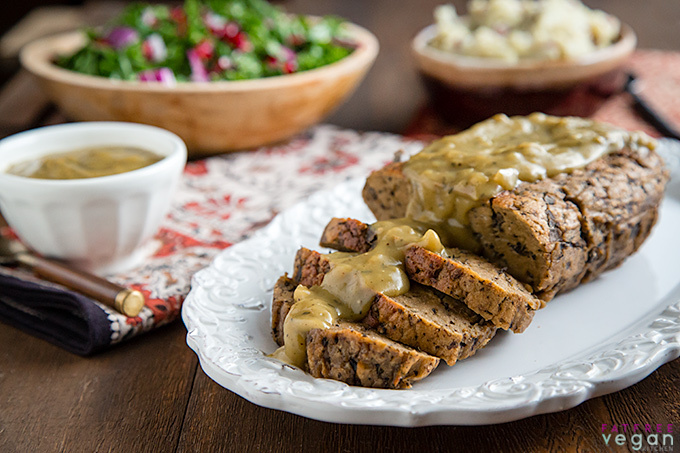 There are three reasons why I’m including this Mushroom Seitan Roast on our list of favorites from now on. First of all, it’s delicious. The mushrooms add a savory flavor without being “mushroomy.” They are chopped fine, and even the hatingest hater of mushrooms would have trouble knowing they’re there. They break up the texture of the seitan a little so that it’s more tender than most gluten roasts without being noticeable themselves. Second, the recipe is fairly easy. You don’t have to stuff one thing into another or baste anything or stand over a stove. Put it in the oven and come back every 25 minutes to turn it over. That’s it. And finally: Leftovers. This roast firms up in the fridge overnight and makes the best thin-sliced sandwiches ever. Enjoy! 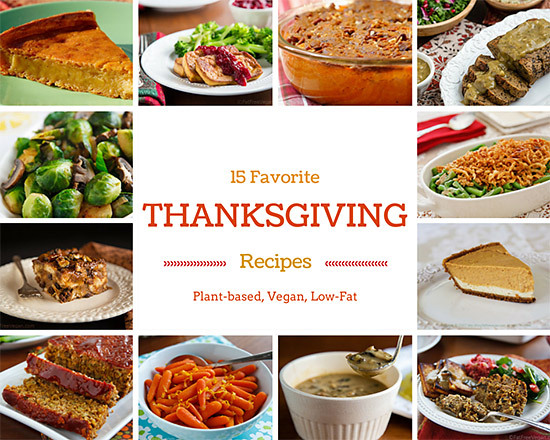 Be sure to check out all 56 of my Thanksgiving Recipes, with more added all the time! This roast is delicious hot out of the oven, but what I really enjoy is making the leftovers into sandwiches. After refrigerating, slice the seitan very thin and warm it in some gravy. Serve on crusty French bread with lettuce and tomato. Heaven! Wash and dry the mushrooms. 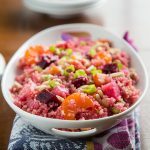 Place them in a food processor fitted with the chopping blade and pulse until they are finely chopped. Set aside. 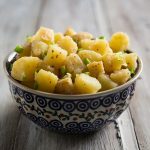 Combine in a mixing bowl: gluten, oats or quinoa flakes, nutritional yeast, thyme, sage, onion powder, smoked salt, and a generous grating of black pepper. Mix well to distribute all ingredients evenly. Place the broth, soy sauce, garlic, and nut butter in blender and blend until smooth. Add the contents of the blender and the mushrooms to the dry mix and stir until combined. Once it becomes hard to stir, use your hands to knead the ingredients together, making sure that all the dry mix is moistened. Shape into a ball and set aside. Preheat oven to 400 F. Cut two 20-inch pieces of aluminum foil. Place them on the counter with one overlapping the other horizontally by about half its width. You should have a surface of foil about 20 inches wide by 20 inches deep. Cut a piece of parchment paper about 20 inches long and place it over the aluminum foil with the bottom edges even. Put the uncooked seitan in the middle of the parchment, and shape it into a loaf about 9-10 inches long. Fold the short ends over the seitan and then bring the long edge closest to you over and roll it up. Place it on a baking sheet with the edge of the foil down. Bake for 25 minutes. Turn over carefully and bake for another 25 minutes. Turn again and bake for another 20-30 minutes. 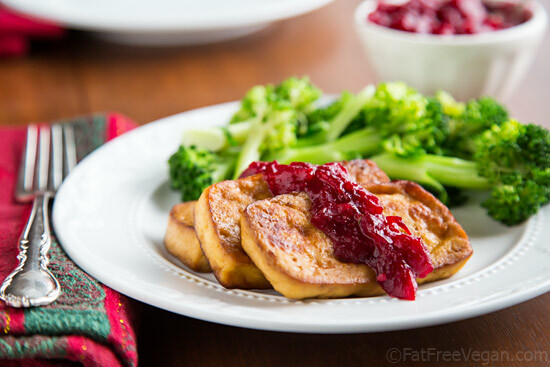 Seitan should feel firm and not jiggly. You can test for doneness by cutting into the middle and making sure that it is firm and not dough-like. If necessary, give it more time. Remove from oven and allow to cool for a few minutes before slicing. Keep leftovers tightly covered to prevent them from drying out. Makes about 12 1/2-inch thick slices. 2 slices = 1 serving. Hi Susan and thank you for this mushroom roast recipe, I followed the directions exactly ( I cooked mine a bit longer) and is was so good. My boyfriend was so pleased with it, he wants me to make it all the time. I am going to experiment with the spices and see what else I can do but I will use this base from now on, I love the mushrooms. 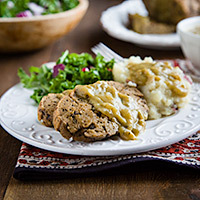 This seitan roast is a winner! It’s fool-proof AND adaptable – and is on its way to becoming a staple for us. Thanks so much for your wonderful recipes. Thank you SO MUCH for this recipe. Although I am not vegan, just vegetarian, I have a hard time getting as much protein as I like. I’m an athlete so I shoot for 100g+ per day, but egg whites, greek yogurt and soy get tiresome. I love that this is such a lean source of protein and SO tasty. I have made this at least 10 times in the past few months and I know that I will continue to make it! P.S. In case anyone is wondering, I sub oil for the vegan butter and that works well! I used 8 mushrooms instead of 10, and I chopped and peeled 1 medium sized beet and blended it and added it to the blended mushrooms. I increased the gluten to 2 3/4 cups and replaced the 1/2 cup of oats with 1/2 cup chickpea flour. Also added 1/2 tsp turmeric. Super tasty! Yes I think halving would be fine. Start with half of the time and check it every 10 minutes until it’s done. Thank you so much for this recipe! You’ve been my guide through my beginnings as a new vegan and this roast has made me a hit with the whole household! This roast is indeed delicious and leftovers do make the best sandwiches! Dear Susan, You are godsent thank you.I am a vegan and now am starting a fat free cooking with oil.your receipe’s are great . I did cut down on the sugar and spices in the Sweet Potato dish as I wanted it as a side not a dessert. I made this and the flavor was great, the ends were very tasty, but the middle was really dense yet mushy. Do you think I didn’t cook it long enough, or maybe should have kneaded it more? Thanks! I’m sorry the middle wasn’t done. More time would help, and if you could make it a little longer and thinner next time, that would help the middle get done. Finally made this as trial for our holiday dinner. It’s a good one! Followed recipe as written plus 1 tbsp tomato paste. Baked extra 20 min after reading comments, but in hindsight not necessary. The roast’s stellar performance was the next day – sliced thinly and heated in delicious gravy. Thanks for another winner. Can you just put it in a parchment covered loaf pan? Since my baked seitan often turns out ‘iffy’ in terms of dryness or bread-like, I decided to pressure cook this. It was FABULOUS. Definitely a new tradition for Thanksgiving in this household! I made it exactly as written, but couldn’t help adding some smoked paprika and some Kirkland no-salt seasoning. Then I rolled it in parchment paper-lined foil and twisted the ends. (You could also roll it in cheesecloth and tie the ends.) I lowered it into my Instant Pot, put in a mix of 3 c vegetable broth, 2 c water, 1/4 c soy sauce, a tsp onion powder, and 2 T vegan worcestershire sauce. Then I pressure cooked it for 30 min. After it cooled naturally, the center seemed a bit soft (mine was fat, as my Instant Pot is the small one), so I stuck it back in for 10 more minutes and let it release naturally once more. After cooling in a bit of broth in the fridge, it slices thinly and makes a wonderful un-turkey sandwich. So moist and tender and flavorful! I’m sure it will be wonderful sliced with potatoes, gravy and stuffing on the big day! Thank you for an amazing recipe, Susan! 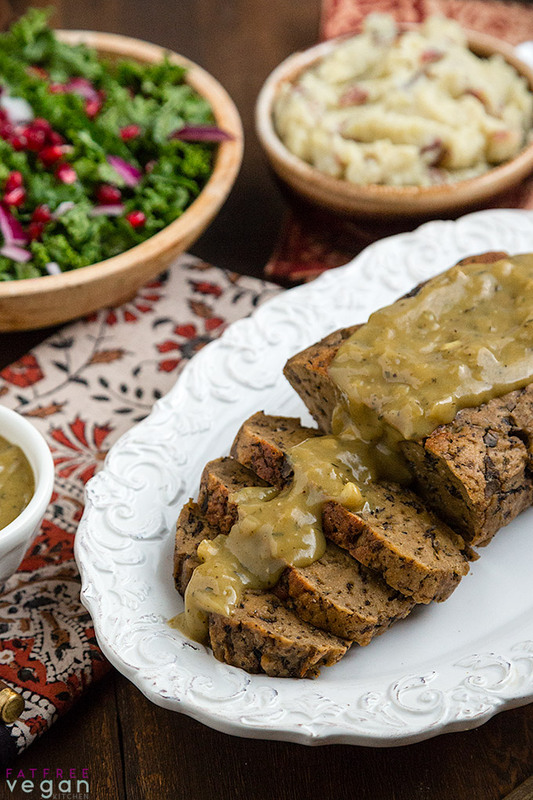 I made your mushroom seitan loaf for Thanksgiving this year… it was really good! Thank you for the great recipe! I’m so happy you liked it! I’m in Mississippi, and I wish I had the energy to make it this time of year. It’s one of my favorites. Could I make this with only parchment paper and not foil and perhaps put it in a loaf pan wrapped in the parchment paper? I don’t use aluminum foil after Dr. Mcdougall ‘s recent webinar on aluminum and Alzheimer’s. You could try, but I’m not sure it’ll be tight enough. The whole reason for the parchment paper is so the food doesn’t touch the foil. Thank you Susan for your quick reply. I made it with only parchment paper in a loaf pan and cooked it as long as the recipe called for. The outside was very dry but the inside was great. I wonder if it was very dry because of my convection oven or maybe because of not using aluminum foil. 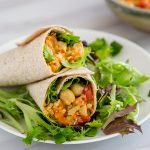 I really love all your recipes and thank you for sharing your talent as I am immensely grateful to be able to cook your healthy and delicious recipes for my family. I’m glad you liked it! Yes, the foil helps keep in moisture. I wonder if it’d be moister if you cooked it in a covered Dutch oven. I loved this recipe and paired it with your mushroom gravy. The only issue that I had was the parchment paper stuck to the loaf and I had to carve it off. The areas where it didn’t stick were golden and the texture was amazing. Any pointers for me? With recipes like this I hope to convert my carnivore spouse.